Using deceptive ad slogans like “Obama’s New Forgiveness Program” and “We Work for the Department of Education,” private companies are charging student-loan borrowers for services that falsely claim to provide debt relief, forgiveness, and consolidation. The pervasiveness of these so-called debt-relief companies is a growing problem for millions of borrowers—a problem that gets far too little attention. 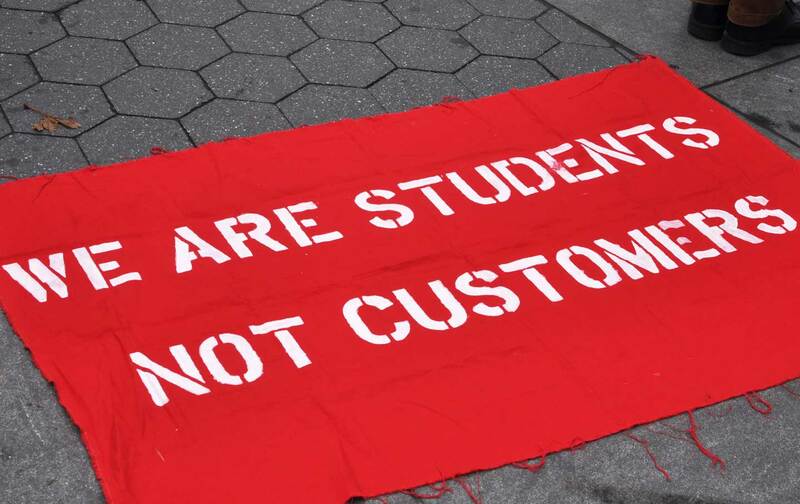 In July 2016, Student Debt Crisis and NerdWallet conducted a survey of customers of privately operated student-debt-relief companies in an attempt to shed light on their abusive profiteering. Prior to this survey, advocates, experts, and legislators remained largely in the dark about their predatory practices. Survey results from 6,363 respondents discovered that the average borrower paid $613 for private debt-relief services that are, in fact, offered for free by student-loan servicers and the Department of Education. Sixty-five percent said their financial situation was not improved. Those who paid for student loan debt relief, forgiveness, or consolidation services reported high prices and abysmal satisfaction, confirming that these companies are generating massive revenue for assisting borrowers with something they can easily do themselves through free programs. It doesn’t stop there. One-in-four borrowers are contacted directly by these companies on a weekly basis. Such frequency highlights the unrelenting tactics student-debt-relief companies use to entrap borrowers, including targeted social-media ads, persistent phone calls, and direct text messages. “It’s highly unethical and should be illegal for these so-called ‘debt-relief’ companies to be preying on already financially vulnerable students and graduates,” said Nicole W., a Student Debt Crisis member. It is no surprise that borrowers who are uncertain of their financial security are vulnerable targets for these practices. 70 percent of borrowers are eligible for lower payments under government programs that cost nothing, but very few actually know about the plans. We are warning all student loan borrowers who have trouble managing their student debt to watch out for scams run by companies promising ‘student debt relief.’ These companies prey on distressed borrowers who run into trouble and struggle to figure out what comes next. In some cases, borrowers do not think their student loan servicers can help them and seek help from a third party. Others are lured in by aggressive marketing practices that target the most vulnerable student loan borrowers. Student borrowers carry a staggering total of $1.3 trillion in loan debt, hampering dreams of homeownership, starting a family, and saving for retirement. The pressure of debt on people’s lives is enormous as indicated by the survey respondents — one in three borrowers carried an individual student-debt load of over $75,000. That equates to a monthly student-loan payment of more than $700. A toxic combination of high student-loan debt and depressed wages makes it easy to understand why debt-relief companies seem appealing, and why their misleading, scare tactics and lofty promises work. Ultimately, debt-relief companies aggressively advertise their services and misrepresent federal repayment programs, confusing the very borrowers they claim to help. The company charges for its services. Options through the Department of Education and federal student loan servicers are free. The company asks for borrower’s personal information. Borrowers should not give a third-party company access to their online federal student-loan account, share their Social Security number, or sign a power of attorney to give the company control of their student loans. The company implies that it’s affiliated with the Department of Education. Some companies’ websites try to convince borrowers that navigating federal student-loan programs is too complicated to do alone. Although the system can indeed be complicated, borrowers can sign up for consolidation, repayment plans, and forgiveness programs on their own. Borrowers should call their loan servicer if they have questions; it’s part of a loan servicer’s job to help borrowers understand their options. The company charges upfront fees. It is illegal for debt relief companies to charge upfront fees before they have performed any of the offered services. Companies that demand initial payments are looking to make a quick buck before they are exposed for doing very little for borrowers. And, remember: Student-loan borrowers should never have to pay for these services. If you’ve encountered a student-loan-debt relief company, please share your story at StudentDebtCrisis.org. To complain about or receive advice on dealing with a particular scam that might have affected you, please contact the CFPB. Cody HounanianCody Hounanian is a higher education advocate and the digital director of Student Debt Crisis.